Do Your Homework – Then Cross Your Fingers! Somehow time got away from me and I found myself in need of a new-baby gift fast. This was for someone special, so of course I wanted to give a quilt. But there was no time to make one. After much debate I headed off to Etsy to see what’s available and what it might cost. I was surprised to learn that while it would cost more than if I made a quilt myself (no surprise there), a machine quilted and pieced quilt was within the price range that I felt comfortable with. Plus, when you add in the cost of the time that I did not have to spend, and the value of giving a handmade gift that (hopefully) will be treasured for years, purchasing an already made handmade quilt seemed like a bargain. So the hunt was on. There are oodles of handmade quilts on Etsy and I soon learned a few things that ultimately made the process and decision easier. Baby quilt purchased from ForgetMeNotQuilteds on Etsy. 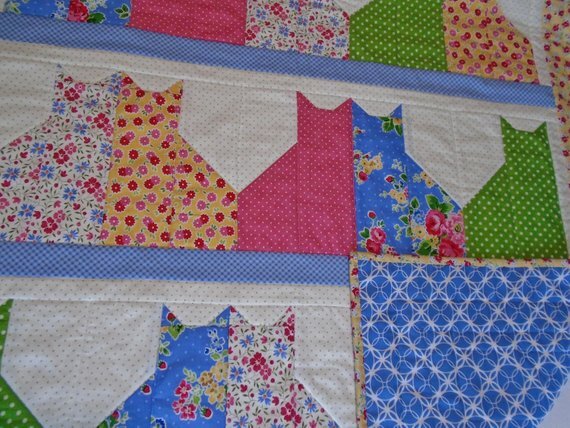 In my case I wanted a crib sized quilt with cats in some form, since the parents love cats. Nothing pastel, as the parents are into more vivid colors. 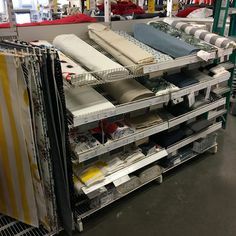 And, I wanted something that would evoke comforting thoughts of home and family, since their family lives elsewhere, so I looked for more homey vintage type fabrics. 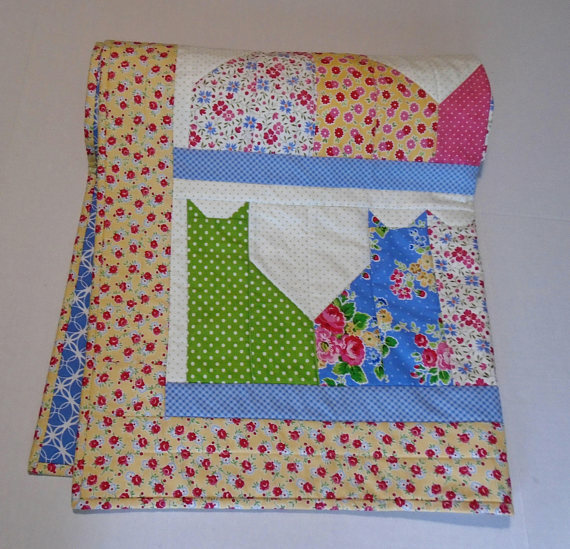 Typing “handmade baby quilt” into the search field yielded hundreds of results. 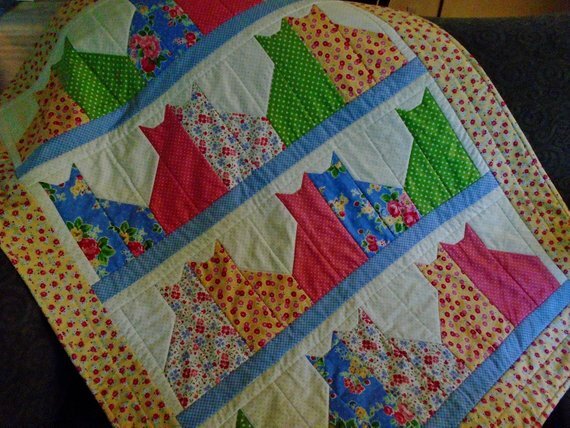 “Handmade baby quilt with cats” narrowed it down to a workable number. “Handmade baby quilt with red and yellow cats” is probably too limiting, so play with search terms until you find one that yields a good number of results without being overwhelming. One quilt I liked had poly batting and flannel backing. 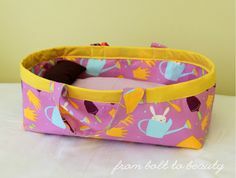 While this would be nice for a winter baby, I wanted all cotton so the quilt could be used during summer months and still be cozy when cool weather comes. Others I liked were called crib quilts but were smaller than crib quilt size. Still others had poly fabric … and so on. Read the description carefully to make sure you know exactly what you’re getting. Also look for a statement that indicates that the quilt is from a smoke-free home so it doesn’t arrive with unexpected odors. In my case, the description for the quilt I purchased did not say that but the reviews were glowing so I decided it wasn’t an issue with this quilter. Scrutinize pictures carefully to get a sense of how well the quilt is made. A few of the quilts I was interested in were obviously not of the quality I wanted. One was rippled on the front and back, indicating a poor job of layering. Another had crooked machine stitching along the binding and in the stitch-in-the-ditch quilting, while a third had very little quilting and wouldn’t hold up well to many washings (a must for baby quilts). Closeup photos are essential. Pass an offering by if there are none, or email the seller and ask for them. 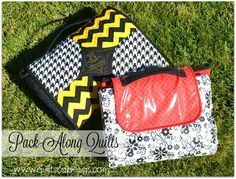 It’s also nice to see a photo showing some of the backing so you can see how well it works with the front of the quilt. You know the quilter cares about their products if they provide good instructions about how to care for the quilt. 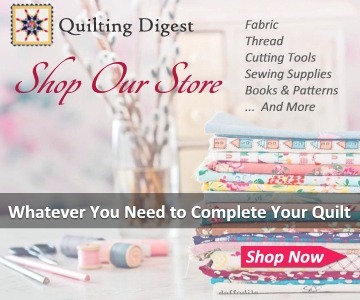 While there aren’t likely to be reviews for the actual item you’re considering (if it’s a one-of-a-kind), reviews for other items by the same quilter can be very helpful. Are there recent comments about the quilter’s work? Are they positive? Negative comments can be informative so pay attention to those, too. 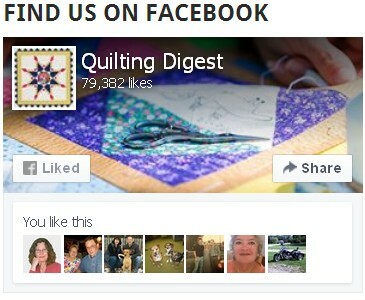 How many stars has the quilter received? In this case the quilter I purchased from had many positive comments and a full 5 stars. Perfect. However, I would buy from someone with less than a perfect score, provided I read through several comments, understood why people were not giving 5 stars and felt comfortable that their reasons would not impact what I wanted to purchase. For example, a buyer might mark down for delayed shipping, but that may not matter to me under the right circumstances. Well put-together listings should tell you when the item will be shipped and what shipper will be used. From that, based on their location and yours, you can determine within a couple of days how long it will take to arrive. Or, contact the seller and ask what to expect. Don’t Expect Colors to be Exactly What You See on Your Screen. As much as we want a quilt to arrive looking exactly as it does in the pictures, that seldom happens. Every screen displays color a bit differently, plus photos can be off depending on the lighting where they were taken. Two photos of the same quilt can show colors a bit differently, too. So be somewhat flexible with color. Use the photos as a guide and expect a bit of variance. If you need to match colors exactly, you might contact the seller and ask for swatches. Most Etsy listings have an “Ask a Question” button under the product’s title. Take advantage of it to clarify things you’re wondering about. If the seller takes several days to respond, be careful. You don’t want to buy from an unresponsive seller. In some cases a return policy doesn’t make sense, like for downloadable quilt patterns. However, you want the insurance of being able to return handmade goods should they turn out to not be what you expected. Carefully consider the terms and make sure they allow a reasonable amount of time to return the item if you need to. In my case, even though it stated that the quilt would be shipped in one business day, it needed to travel half way across the country and I wanted to make sure it would arrive on time. I sent a note with my purchase asking the quilter to please let me know if it would not arrive by the baby shower date. She replied the same day and assured me that it would. And it did. If you’ve done your research, you should receive a quilt you’re thrilled with. However, we all know that sometimes, despite careful consideration, things purchased online aren’t what they seem. Rely on the return policy to help you out if you don’t like what you receive. While the guidelines above were generated from my shopping experience on Etsy, the tips apply to any vendor. 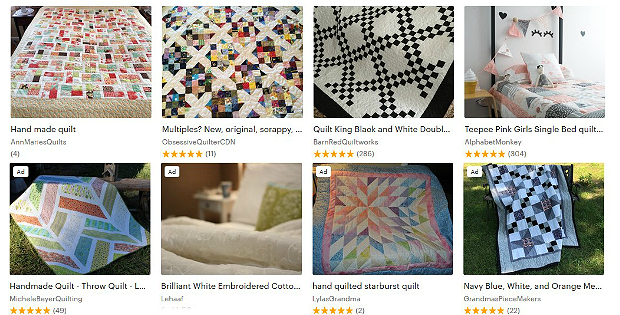 Ebay offers new handmade quilts, as do many quilt blogs and websites. I absolutely love the quilt I purchased and I know the new parents will too. It’s more beautiful in person than in the pictures and is very well made. I gladly recommend the quilter, Jennifer Norman of Forget Me Not Quilteds, to anyone wanting to purchase a new handmade quilt. You’ll find a nice selection of small quilts in her shop here. You’ll find a wide selection of handmade quilts on Etsy here.